FROM THE BESTSELLING AUTHOR OF TEN BEACH ROAD AND OCEAN BEACH, A NEW NOVEL OF FOUR FRIENDS—AND A SHARED PASSION THAT COULD CHANGE THEIR LIVES. Samantha Davis married young and for the wrong reason: the security of old Atlanta money—for herself and for her orphaned brother and sister. She never expected her marriage to be complicated by love and compromised by a shattering family betrayal. Claire Walker is now an empty nester and struggling author who left her home in the suburbs for the old world charm of The Alexander, and for a new and productive life. But she soon wonders if clinging to old dreams can be more destructive than having no dreams at all. And then there’s Brooke MacKenzie, a woman in constant battle with her faithless ex-husband. She’s just starting to realize that it’s time to take a deep breath and come to terms with the fact that her life is not the fairy tale she thought it would be. 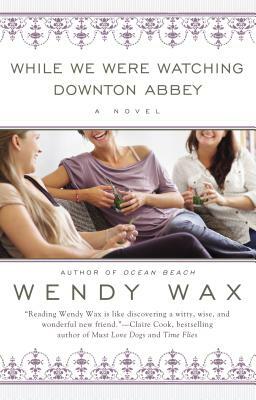 For Samantha, Claire, Brooke—and Edward, who arranges the weekly gatherings—it will be a season of surprises as they forge a bond that will sustain them through some of life’s hardest moments—all of it reflected in the unfolding drama, comedy, and convergent lives of Downton Abbey. Wendy Wax, a former broadcaster, is the author of nine novels. The mother of two college age sons, she lives in the Atlanta suburbs with her husband and is doing her best to adjust to the quiet of her recently emptied nest. How does watching Downton Abbey draw these characters together? Do you think this is part of the value of a hit television show? How has watching Downton Abbey or any other favorite show added to your life? Could you imagine yourself making a new friend through a shared interest in Downton Abbey? Downtown Abbey chronicles the lives of the very wealthy and the people who serve them. How is this paralleled in the interactions we view between the characters in the book? How do these relationships evolve? Samantha, Claire, and Brooke come from very diverse backgrounds and are each at a different stage in life. How do these differences help to bond them together and foster their friendship? How would their ultimate outcomes be altered if they had never become friends? The relationship between mothers and daughters is a prevalent theme in While We Were Watching Downton Abbey. Readers witness Samantha's interactions with her mother-in-law, Cynthia Davis, as well as Samantha's motherly bond with Meredith; Claire's connection with Hailey; and Brooke's relationship with Ava and Natalie. Discuss the effects of each of these mother-daughter relationships on Samantha, Claire, and Brooke. In a way, Downton Abbey is also a main character in this book. How would you define its role in the lives of those living in The Alexander? How is the show a catalyst for change? Edward Parker's Great Uncle Mason says discretion, persistence, and valor "always win the day" (88). Do you think this belief is upheld in the book? Give examples from the story to support your answer. Food is often described in the book. What role do you think it plays in different settings, such as during the Downtown Abbey gatherings, the family dinners with Samantha and Jonathan, and the meetings between Samantha and her mother-in-law? Can you think of other scenes where food is highlighted? If you were to write a sequel to While We Were Watching Downton Abbey, how would it go? What do you think the future holds for these characters?